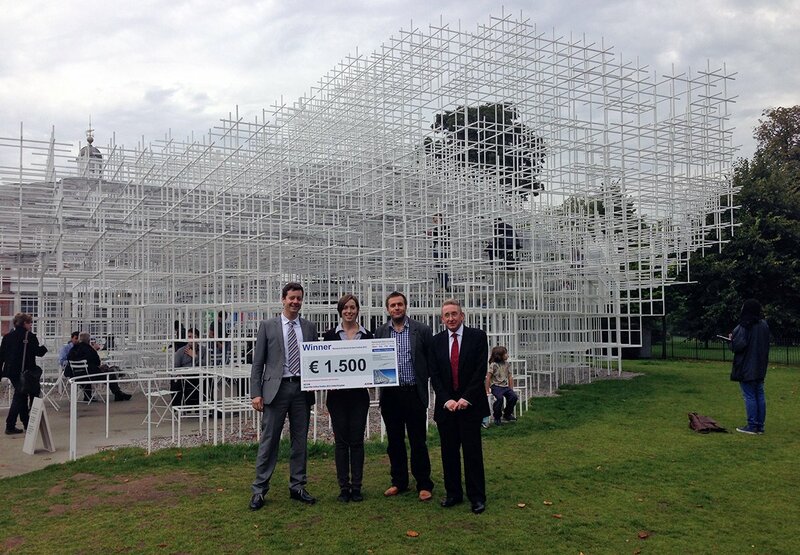 Each year, the Serpentine Gallery commissions an international architect to design their summer pavilion. 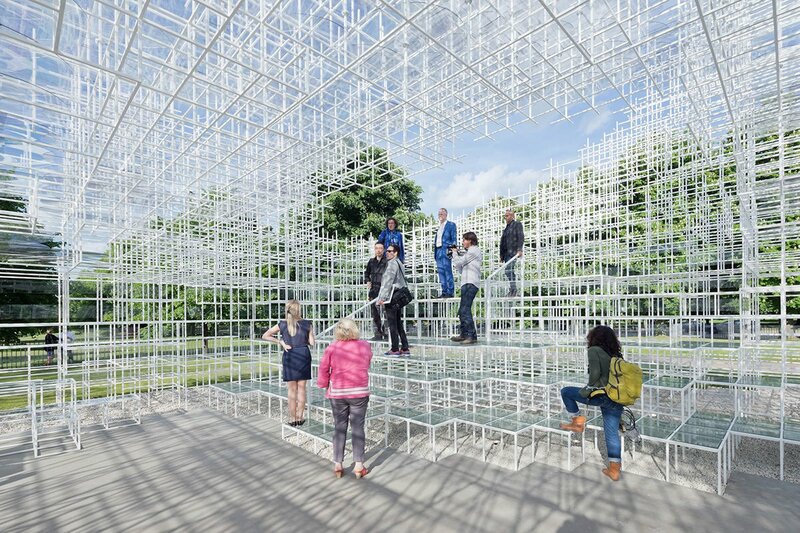 The 2013 Pavilion was designed by Japanese architect Sou Fujimoto, with AECOM carrying out the structural design from concept stage in January 2013 to completion in time for the press launch on 4th June 2013. The Pavilion exemplifies contemporary architecture and the engineering challenge is to mask the complexity of the structure behind simple design and intelligent detailing. The concept is built around a three dimensional 400 mm grid, with 20 mm square hollow sections forming a vierendeel space frame which provides areas of shelter, formed by the addition of circular polycarbonate discs, as well as areas where guests are invited to climb over the structure. The complex nature of the structure meant that a three dimensional analysis model was essential as the structure relies on all 27,000 members for global stability. In the areas where guests are permitted access onto the structure, locally high loading was imposed to allow for the weight of the glass infill panels and the weight of a crowd gathered on the structure. This was combined with accidental load combinations which accounted for unwanted access onto the roof, member removal and settlement of the footings. From the outset it was clear that the detailing of the nodes was vital; they needed to be simple to fabricate, allow easy construction of larger modules for delivery to site as well as on site, connections, and they needed to be able to transfer the full moment capacity of the section across the joint. Several concepts were drawn up and design sessions with the fabricator (Stage One) allowed a detail to be developed which allowed the structure to be constructed in the available timescales. Separate details were needed for the site connections. It was necessary to ensure that the joint could mobilise the full moment capacity of the steel section as this was fundamental to the stability of the structure, which relied on vierendeel action of the frames and the corresponding high moments at node points. To ensure that the capacity of the joints was sufficient, several test pieces were created and tested to destruction. This included small scale single nodes as well as large scale mock ups of portions of the structure. The success of the scheme relied upon electronic collaboration between the design team members. 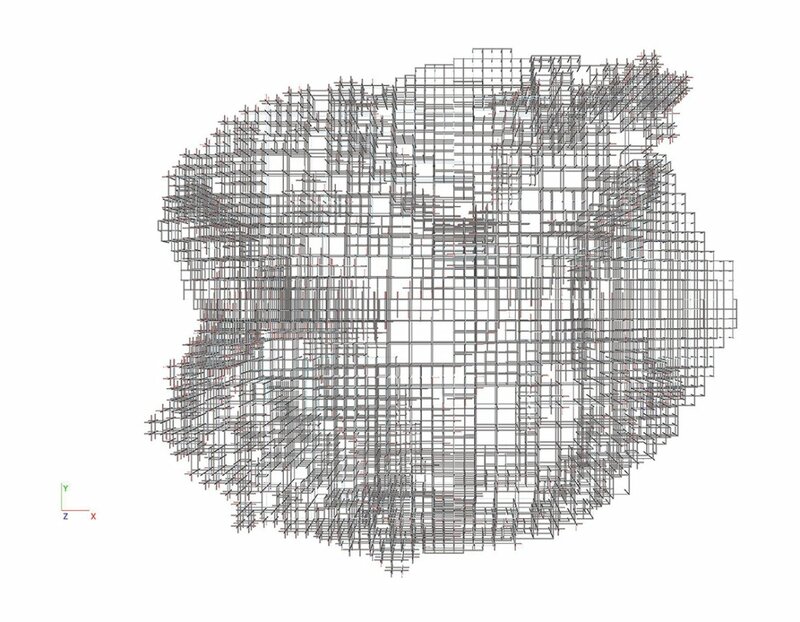 From the outset of the project the design concept was conveyed using 3D models, as the complex structure has very little meaning when expressed as two dimensional sections. The architectural scheme was drawn up using Rhino and bespoke scripts were used to transfer the geometry to Scia Engineer. Fundamental to the success was the ability to make this a complete round trip process, allowing rapid design development with the architect and iteration of the design to a final solution which embodied the architect’s dream as well as functioning structurally. 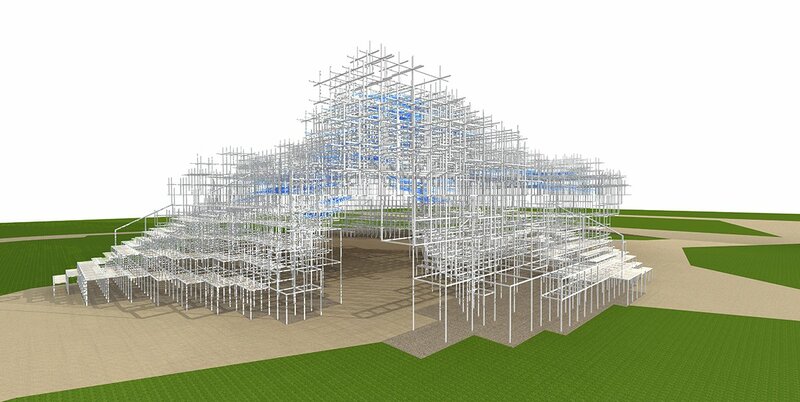 The 3D model was also shared with the fabricator allowing integration with their computer aided manufacturing processes, as well as better visualisation of the structure and optimisation of the size of the fabrication modules for delivery to site and erection within the short construction period on site. 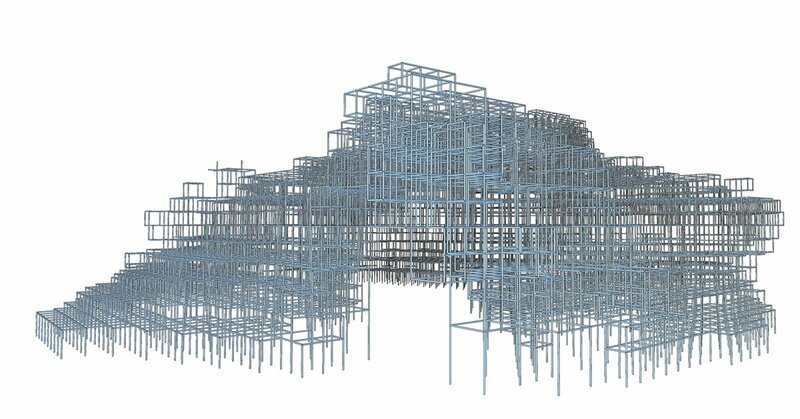 Structural design drawings were produced in AutoDesk Revit. The geometry was transferred to Revit using the Revit-Scia Engineer link.